Absolutely, positively nobody can raise questions about settling issues, energy issues, or the running of electrical or plumbing because this is a conventionally framed energy efficient home. The inside of the home can be half log, knotty pine / spruce tongue and groove planking, drywall, plaster, stone, tile or any combination thereof. This Half Log System features a 2"x6" wall, Tyvek House Wrap and DuPont's patented window and door flashing system. When this wall system is insulated with closed cell spray foam insulation the R-factor is approximately R-38. Note: A typical home with a 2"x4" wall equals a R-Value of R-11. This Half Log System features a 2"x8" wall, Tyvek House Wrap and DuPont's patented window and door flashing system. When this wall system is insulated with closed cell spray foam insulation the R-factor is approximately R-51. Note: Because of the added strength of a 2"x8" wall, this system is often our standard for the majestic tall window (wall) areas in a great room. 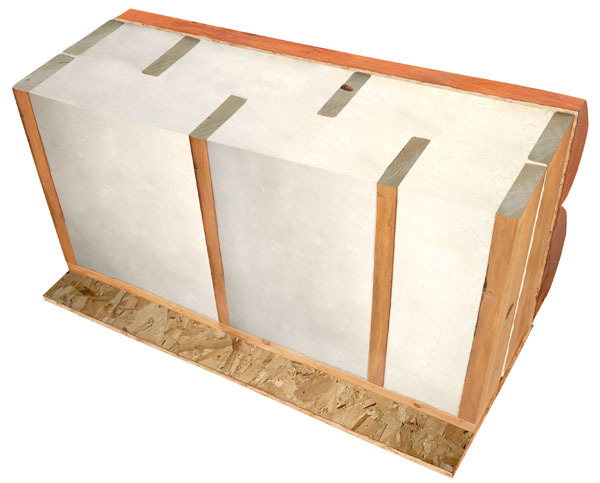 This Half Log System features a double 2"x6" wall with alternating and staggered 2"x6" wall studs, Tyvek House Wrap and DuPont's patented window and door flashing system. When this wall system is insulated with closed cell spray foam insulation the R-factor is approximately R-72. Note: The staggered and alternating wall stud pattern eliminates the possibility of cold transfer through the wall studs. If you like the idea of alternating and staggering your wall studs let us know as we can use a similar system with the R-38 and R-51 walls too! Our solid wood full logs are stacked on top of each other to create a solid log wall. 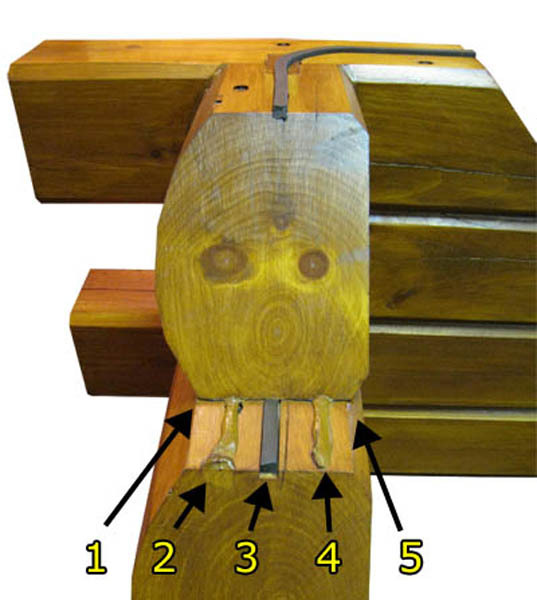 While some of these full log styles are tongue and groove, others are not. 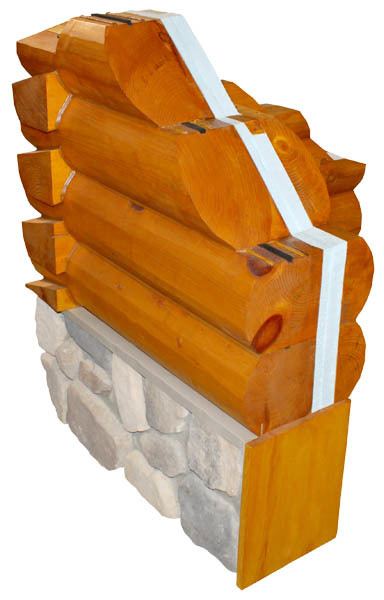 All of our full log wall systems use a combination of wooden joinery and splines, compression foam gaskets and log builder caulking to create an impenetrable weather seal. On most of our full log profiles, we use a 5 point weather-tight seal stacking system that keeps the elements outside and protects your logs. 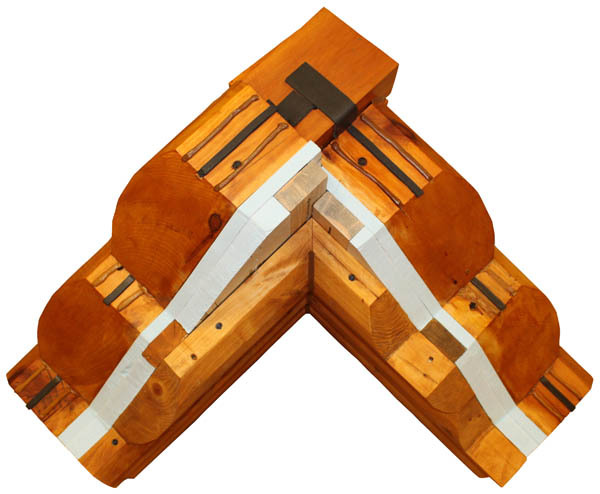 Points 1,2,4, and 5 are Log Builder Caulk® that expands and contracts with the natural movement of the log. 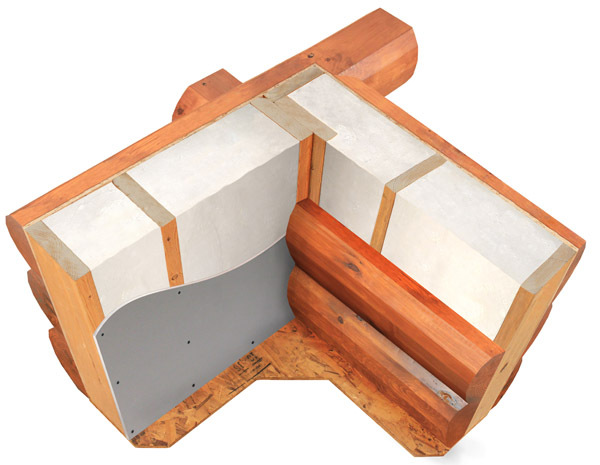 Point 3 is a compression foam gasket that sits in a routed grove. 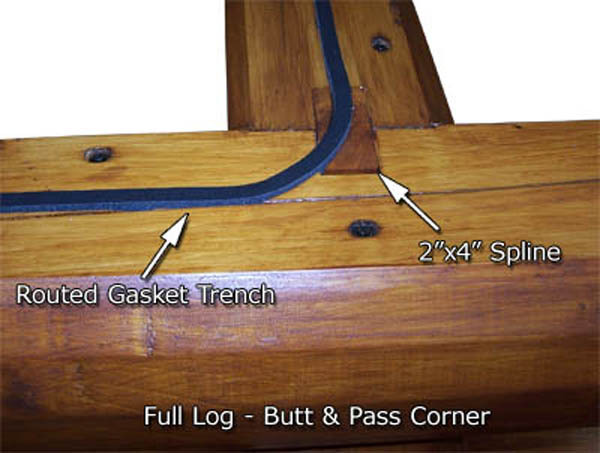 The gasket provides a highly resilient seal that does not rely on adhesion to keep its seal. Full log walls have a high thermal mass property, meaning they absorb energy and later release it. The thermal mass of a full log home is why a full log wall is warm in the winter and cool in the summer. 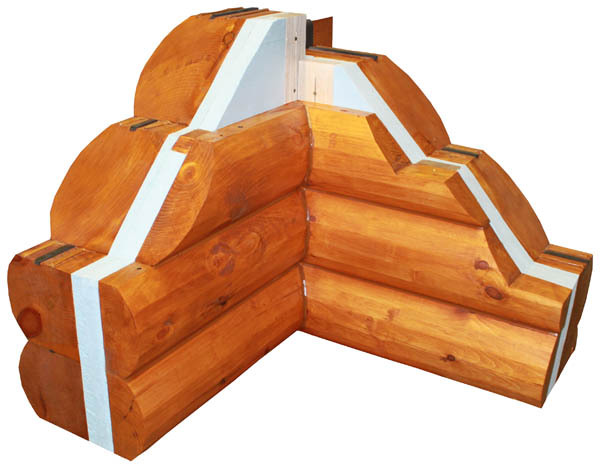 The approximate heating and cooling costs of an 8 inch thick full log home will be similar to an R-19 wall. Golden Eagle's Green Building System will save you money on heating & cooling costs. Our High Performance Full Log Wall System has an R-Value of R-31. This system offers a lot of flexibility by allowing you to choose from interior room finishes such as Round Log, Flat/Square Log, Tongue & Groove, and Drywall. Urethane Spray Foam Insulation is a superior insulation compared to fiberglass or cellulose insulation. It not only has a higher R-Value per inch, it also creates a more comfortable home because air infiltration and drafts will be non-existent. Urethane spray foam insulation also seals out bugs and water and makes your stud walls structurally stronger. Ground Source Heat Pumps (or geothermal) use the constant temperature of the earth instead of the highly variable outdoor temperature as the exchange medium that regulates the indoor temperature. They are twice as efficient as a conventional heat pump and are usually practical for any house with forced-air heating and cooling. Many of you are building on acreage so why not? Tankless Water Heaters can increase your fuel efficiency by more than 50 percent. Tankless or "Flush" units heat water in as little as five seconds and can deliver up to 200 - 500 gallons of hot water per hour. Exterior or Interior Wood-burning Stove may greatly reduce your gas or electric needs in the winter. Catalytic wood-burning stoves are so efficient, they are capable for being the primary heat source many homes. Efficient Lighting to light up your home correctly from the start. Use new LED or Fluorescent Bulbs, inside and out. These types of bulbs run at a fraction of the energy required by standard bulbs. You can also use "Sun Tunnels" or "Sun Tubes" in any room you might want to have FREE daylight. This will save money by not running light fixtures during daylight hours. Energy Star Appliances use 10 to 15 percent less energy and water than standard models. Appliances account for up to 34 percent of your home's utility bill. Plus, new modern appliances will make your home look better. Solar Thermal Water Heaters (like those from Velux) use panels mounted on the roof and can reduce the amount of energy consumed for water heating by up to 80 percent. Programmable Thermostats will do your temperature adjusting for you automatically. For Example: You can set the thermostat to "back off" on heating or cooling while you are at work. For every degree you cut back on heat or air conditioning over an eight-hour period, you will save one percent on your energy bills. Passive Solar Design can save you a lot of energy cost. Let us help you design your new log home and make it as energy efficient as possible. The best time to do this is during the design phase because at that point it is easy to calculate the structure's energy needs. A big part of this process is passive-solar design. Popular in northern climates where the sun swings high in the sky during the summer and low during the winter. The direction of how your home is situated on your lot, overhangs, and other factors can save you a lot of energy expense. Photo Voltaic Shingles can generate enough energy for your home to reduce your dependency on the power company. These special shingles can turn your home's roof into a power plant that generates clean, reliable, and renewable energy. When installed on your log home's roof, the panels can provide all or most of your new home's energy needs. This cutting edge technology can provide reliable power even in partial shade. Radiant Floor Heat can help you say goodbye to cold feet. Radiant in-floor heat is the perfect choice for any room, basement, or garage. You can use gas, wood, or electricity as the heat source for your floor's radiant system. These systems provide constant, penetrating heat that forced air can not duplicate.